Shooting target on a letter size paper in a vertical, portrait orientation. A circular shooting target with fields place to note specifics of the used firearm. Shooting target on an A4 size paper in a vertical, portrait orientation. A circular shooting target with fields place to note specifics of the used firearm. 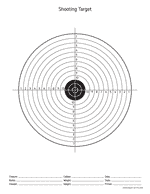 Shooting targets on a letter size paper in a vertical, portrait orientation. 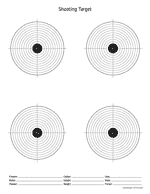 Four circular shooting targets and place to note specifics of the used firearm. Shooting targets on an A4 size paper in a vertical, portrait orientation. Four circular shooting targets and place to note specifics of the used firearm.